The Surface Book is a sophisticated and stand-out hybrid device in many senses, one that has ironed out the majority of issues that affected the earlier US release. It's yet another high brow Windows machine to put on the shortlist, if, that is, you've got the money to afford one. After picking up the Microsoft Surface Book for review, the bag in which it was placed promptly ripped through at the handles as we wandered down the street. Ah, this isn't a lightweight tablet-esque Surface product and, we suppose, we learnt that the hard way before we even started to use the device. As it happens, Microsoft has - and who knows how - made one of the heaviest boxes for a product in the history of products* (almost certainly an exaggeration), as the Surface Book's 1.58kgs all-in weight isn't light but, then again, it's not absurdly heavy either considering the spec. With discrete Nvidia graphics on board joining a powerful Intel Core i7 CPU and a detachable 13.5-inch Surface-like screen/tablet, the Surface Book might actually be the best hybrid laptop device on the market. And, at £2,249 (in this top-end guise; it starts at £1,299 with lesser specs), one of the most expensive too (perhaps that's the weight we could feel?). So where does the Surface Book sit on the hybrid scale - is it truly one for the books as the odds-on favourite winner, or a pricey gamble? When the Surface Book was first revealed in October 2015, it was a total surprise. Given that Microsoft has been telling the world we don't need a "laptop laptop" any more - because the Surface tablet range supposedly offers an all-in-one solution for all - it then went and revealed a hybrid laptop. What the heck? But the Surface Book, thankfully, doesn't feel like a Surface. This isn't just a detachable tablet with a sturdier keyboard dock. It's a through-and-through laptop, really, designed differently in a number of internal areas to provide a split - both physically and power-wise - between tablet and laptop worlds. For starters that 13.5-inch screen isn't just going to come flying off like so many other flimsy hybrid devices. Nope, you'll need to press-and-hold a release button (positioned at F13) so the "muscle wire" - which is tense when power runs through it, poor dear - can relax, ready for release. A swift tug - more a fumble really, as it can be a total pain to separate one from the other - and the two magnetically-connected sections then part. This release mechanism is software controlled because the Surface (i.e. screen component) houses the CPU, while the Book (we suppose it can be called that; i.e. keyboard component) houses the GPU - and if you go ripping those apart when an intense application is using both it's not going to end well. 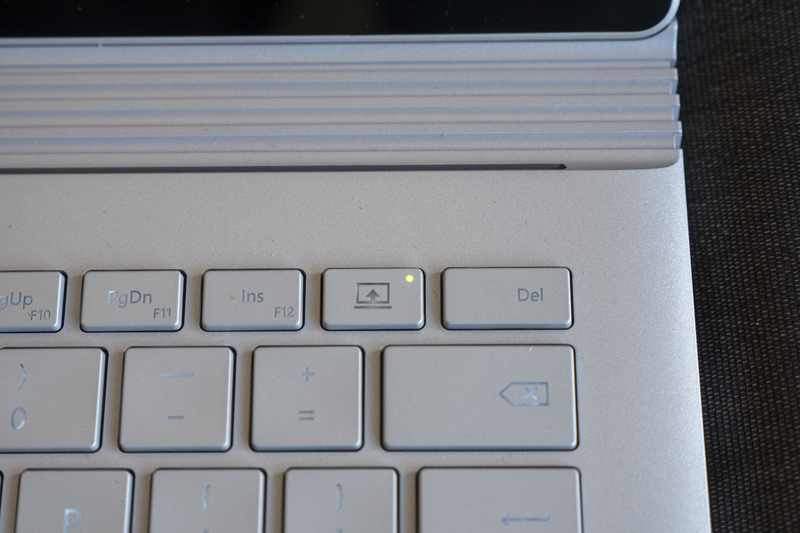 But it does end well in the Surface Book, because that release button works rather well. If its corner LED glows red then, na-ah, you've got something using both CPU and GPU - and a corner pop-up in Windows tells you so in detail, should you wish to cease said applications. If said LED is instead glowing green, it means you're good to go. Both Surface and, um, Book have their own batteries too, so can be used independently. Microsoft reckons you'll get 3-hours from the detached screen when flying solo as a sort-of tablet, extending to 12-hours when the two parts are combined. We're not surprised most of the battery is in the keyboard: there's more space for it, plus it needs to act as table weight to keep the whole device upright. This is also the battery that drains first when both parts are connected; even after a number of hours of use you'll find a 90-plus per cent charge in the smaller battery. 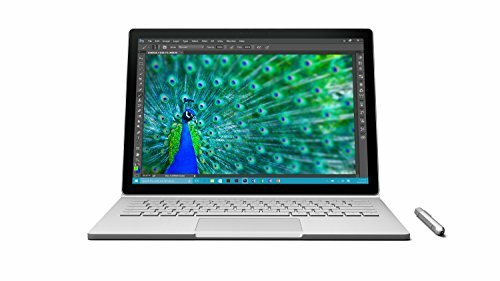 Does the Surface Book last for the purported 12-hours? No, not in our experience. You'd need to be doing pretty much nothing to even attempt that in our view. Use Bluetooth to stream audio, open a browser with Wi-Fi active, a word processor for some typing, and it dips to around 8-to-9-hours - even with Battery Saver in action. Think about using Photoshop and it's sub-7-hours. Get gaming, with the discrete graphics fired up, and you'll carve that time down yet more. Which, overall, puts the Surface Book in a fairly good position. However, it is guilty of typical over-eager battery life headline claims, just as the Surface Pro 4 was (which had poor battery life, thus holding it back from greatness). In our Surface Book we've not suffered the quick drain issues of the Surface Pro 4 either, despite users of launch Surface Books in the States complaining this was an issue - it might be for some users, but not so for us in this guise. Given the 3-hour battery life it's perhaps no surprise the Surface Book, used with the screen released like a Surface tablet, doesn't really feel like a Surface Pro 4. It's more like a carry-around-the-office supplement for when you want to show something to a team mate, or grab the (included) Surface Pen stylus to take notes in a standing meeting (yes, like standing desks, standing meetings are all the rage, we're told). For us we've pretty much never needed to separate the two devices, instead using the Surface Book as a full-on laptop almost entirely. Additionally the 13.5-inch scale feels altogether less "Surface" too. Which, for some, will be a good thing. Our view? The Surface Book ought to be smaller, or at least offer a second smaller version - like an 11-inch model. With Dell squishing down the scale of laptops with the infinity display XPS 13 and XPS 15 models, and Apple, well, captivating much of the world with its it-works-but-its-looked-the-same-forever 11-inch designs, smaller is better for being on the go. The Surface Book, paired with its hefty weight, misses that free-roaming feeling to some degree - despite the point of the screen being that you're free to roam (but probably just around the office). Not that the 13.5-inch screen could be easily criticised, because - to paraphrase Larry David - it's pretty, pretty, pretty good. The 3,000 x 2,000 pixels - there're six million of them, go count - make for a crisp and detailed experience. One that even Windows 10 is happy to adapt to without issue, from what we've seen over our week of use. This is Microsoft PixelSense, a nod to Apple's Retina display - but in a go f- yo'self kind of way. The Surface Book's display is not quite perfect though, on account of a slightly glossy finish that pronounces reflections a little more than we'd like. It's never hard to read content, though, plus there's plenty of brightness, decent colour and great viewing angles throughout. Positionally we find the position of the screen a bit upright for a laptop device. But there's a (semi) solution: as the screen can be detached, it can be reversed and positioned flat table-top or in a stand position. The hinge holds firmly enough for viewing, but it's not completely solid - tapping fingers on the touchscreen or using the Surface Pen will result in that back-and-forth "bounce" after each touch, like waiting for a circling penny to settle on a table, which isn't ideal. That doesn't happen with the Lenovo Yoga 900. And that's all because of the hinge, otherwise known as the Dynamic Fulcrum Hinge to give its full name. A fulcrum being "a thing that plays a central role" - which is bang on here, as this hinge, both aesthetically and functionally, defines what the Surface Book is about. It's certainly an overbearing name, not that you'll hear anyone describe it in such a way. It might not have the 813-piece makeup of the Lenovo Yoga 900's multi-positional hinge, nor is it as rigid, but the Surface Book's hinge is a fairly tidy solution. In a sense it doesn't really look like a hinge, so you wouldn't necessarily think those metal band could almost roll-up - but they do, creating a four-piece c-shaped holder when flat (or "flattish", really, because there's always an opening to the centre of that c-shape when the device is stowed, which isn't entirely elegant). We do rather love the monochrome style, with everything a matte silver/gunmetal grey, but this choice of finish does look sort-of budget from afar. It's not, of course, as it's magnesium - it just looks a little matte and plastic unless you're physically handling it. In the top-spec guise the Surface Book in is a really bloomin' powerful device. There's an Intel Core i7 processor (dual-core 2.6GHz 6600U) paired with 16GB RAM, 512GB SSD, plus the Nvidia discrete Graphics Processor with an additional 1GB GDDR5 RAM. Ultimately it's more powerful than a MacBook Pro. It's also a lot more expensive. That lot hitting the £2,249 price tag. But even with the Core i5 and Intel HD graphics 520 the start price is £1,299. That's a heck of a lot of dough, seeing the Surface Book position itself at the top of the hybrid stack in price terms. Talk about blowing its own trumpet. And yet we can, in part, see why. Microsoft will sell this device, no doubt, but not en masse given that it's probably about £2-300 more than most would like to pay. Sure, a MacBook Pro doesn't have a removable screen, nor the discrete graphics, so it's a case of balancing out what you want or realistically need. As Windows 10 devices go this is one smooth operator, including Windows Hello facial recognition for super-fast sign-in, but there are some fall-down points. Just like with the Surface Pro 4 we're perplexed by the absolute absence of a Microsoft Office install - which costs £70 a year on subscription. Pretty ridiculous for a device that costs well over a grand, although it's possible to use Office Online to view read-only documents for free. Additionally there are some software oddities, such as auto-rotate confirmation popping-up all the time. The keyboard keys follow the same grey/silver finish as the rest of the device and feel great in use. Some keys, such as Shift and Caps, are a little small - but it's nothing unusual. The only real weakness is a lame distribution of light for the backlight - they should be far better diffused and presented at this price point. It's all about the details, Microsoft. 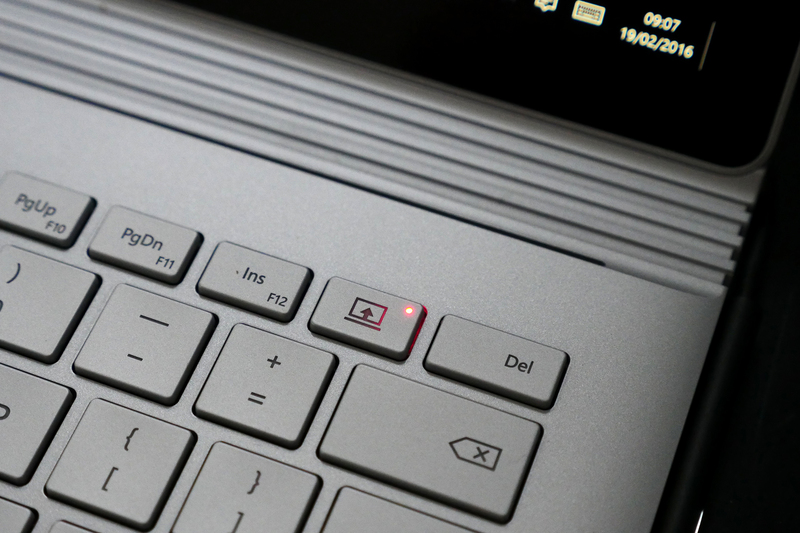 The trackpad is comfortable to use too, providing a reassuring click when pressed, although it's a fair bit louder than the quiet keys' operation. And then, but of course, there's the Pen stylus - the very same as found in the Surface Pro 4 - which firmly magnetises itself to the side of the Surface Book. It has a built-in battery (said to deliver a year of life), 1,024 levels of pressure and an end eraser which doubles up as a control button. In its new guise you can click the eraser to open One Note, grab a page and scribble notes over it, then fling it in an email. Great, if you're into that kind of thing (we've rarely used the Pen, but it's all down to preference, and we get that). So is the Microsoft Surface Book odds-on favourite for best in its class? In one sense, yes, because it's well conceived and potentially ultra-powerful hybrid device with a great screen and release mechanism. But it's horribly expensive, rather heavy to cart around (we'd like a smaller 11-inch version/option), the battery life isn't as sophisticated as it claims, and in a market with Dell XPS, Apple MacBook Pro, HP Spectre x360 and Lenovo Yoga 900 (ok, so none of those have the big sell of a detachable screen) taking the pricey leap into this new world of Surface won't be for all. For those who do take that leap, though, it's certainly no gamble: the Surface Book is a sophisticated and stand-out hybrid device in many senses, one that, in our review sample case, has ironed out the majority of issues that affected the earlier US release. It's yet another high brow Windows machine to put on the shortlist, if, that is, you've got the cash to afford one.